​Flash technology has seen rapid advancements in the last few years including, with the mass production of planar 1x nm NAND, TLC, and 3D NAND. External high-speed interfaces such as USB 3.1 Gen 2 and Thunderbolt 3 have also become ubiquitous. The advent of Type-C has also enabled device vendors to agree upon a standardized connector for their equipment (be it mobile devices or desktop PCs). These advances have led to the appearance of small and affordable direct attached storage units with very high performance for day-to-day data transfer applications. Samsung has been an active participant in the high-performance external SSD market with their Portable SSD series. The T1 was introduced in early 2015, while the T3 came out in early 2016. The T3 was the first retail product to utilize Samsung's 48-layer TLC V-NAND. Today, Samsung is launching the Portable SSD T5. It is a retail pilot vehicle for their 64-layer TLC V-NAND as they ramp up its production. The Portable SSD T5 comes in four different capacity points - 250GB, 500GB, 1TB, and 2TB. It also moves up to a USB 3.1 Gen 2 Type-C interface, while retaining the same compact form factor and hardware encryption capabilities of the Portable SSD T3. Retention of the same maximum capacity point as the T3 (2TB) while moving to denser 64-layer V-NAND. 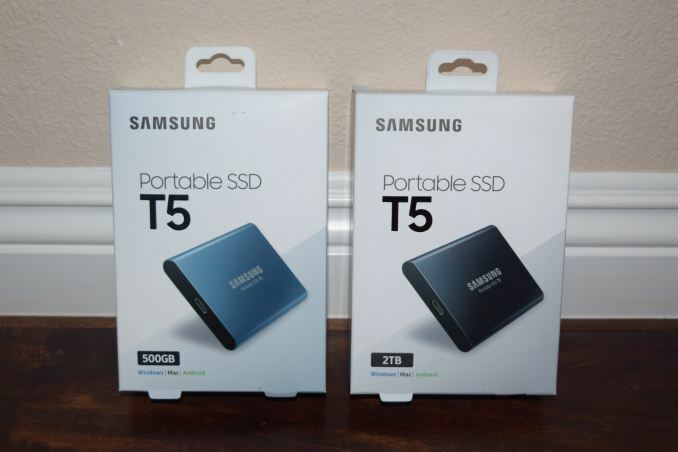 The Portable SSD T5 series is available for purchase today, starting at $130 for the 250GB model. Samsung sampled us the 500GB and 2TB variants for evaluation. The T5's form factor is very similar to that of the T3. It is not a thumb drive, but it is definitely compact (dimensions of 74 x 57.3 x 10.5mm) and lightweight (51g). Samsung claims that it is shock-resistant, and can withstand a 2m fall. The USB-C port is the only visible opening in the T5's case. There are four screws well-hidden by seamless stickers. The package also comes with two 0.5m cables - 1x USB Type-C male to Type-A male, and 1x USB Type-C male to Type-C male. Both are obviously rated for USB 3.1 Gen 2 operation. 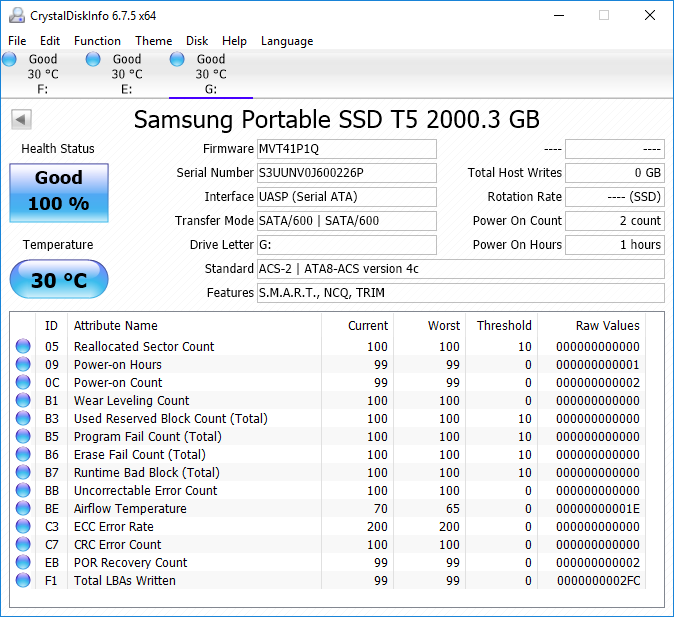 Prior to looking at the internals, CrystalDiskInfo provides us some insight. We only look at the 2TB variant here (the 500GB version is quite similar). Despite the indication of S.M.A.R.T support, the relevant data was not visible to most of the commonly used tools. On the USB side, the drive supports UASP (USB-attached SCSI Protocol) that should provide increased performance for sequential transfers. Claimed transfer rates are 540 MBps for sequential accesses, which essentially means that the SATA interface of the internal SSD can be saturated. We also have hardware-accelerated AES-256 encryption. In the rest of this section, we will take a look at the internal hardware followed by some usage impressions. Compared to the T1 and T3, the T5 proved to be very easy to disassemble, needing only two out of the four screws to be removed. The internal PCB could then be easily slid out. Various pictures from our disassembly process (including shots of the heavy thermal protection) are available in the galleries below. The teardown of the 2TB version shows the ASMedia ASM235CM bridge chip on the board with the Type-C connector. Attached to the board is a mSATA device with four flash packages, a SSD controller, and a single DRAM package. The four flash packages all carry the K9DUGB8H1A tag, while the controller is the standard MGX one used in the 850 EVO series (S4LN062X01). The DRAM part number is K4E8E164EB-SGCF 8Gbit package, pointing to 1GB of LPDDR3 (the same as the Portable SSD T3 2TB version). The mSATA segment of the Portable SSD T5 2TB is essentially the same as that of the Portable SSD T3 2TB, except for the four flash packages. The 500GB teardown was similar to the 2TB version. The only difference was in the mSATA card. Instead of four, we have only two flash packages. The part number is also different (K9OMGY8H5A) since we only need 250GB per package, and that can be achieved with just half the number of dies that need to be in the package of the 2TB version. The DRAM part number (K4E4E16-4EESGCE) indicates 512MB of LPDDR3. Overall, it is again similar to the 500GB 850 EVO, except for the flash packages. The other side of the mSATA PCB, despite having no flash packages, is protected by a thermal pad between the board and the internal plastic frame. The Portable SSD T5 comes with security disabled by default. The default exFAT partition is mounted automatically upon connecting to a PC. If the Samsung Portable SSD software in the partition is installed, a password can be set up to enable security / encryption. If a password has been set before, a 83MB FAT32 partition is mounted first. This read-only partition has a copy of the Portable SSD software which can be used to enter the password and unlock the drive. Therefore, deleting the Portable SSD installer in the main partition is perfectly fine even if encryption has been enabled. Coming back to the usage aspects, the exFAT volume is available without installing any special programs on both Windows and Mac OS systems. Linux users might need to install an external package to get exFAT support. Though Samsung claims Android support for the unit, it is only for the encryption aspect. The Portable SSD app allows users to enable / disable / unlock the encryption (security) on a drive. We attached the T5 to a Huawei Nexus 6P using the Type-C to Type-C cable that came along with the phone. There was no trouble accessing the drive on the phone. The only caveat is that Android doesn't support exFAT. Samsung's updated Portable SSD app still doesn't enable exFAT support. In any case, the Nexus 6P force-formatted the T5 in FAT32, but, after that, there was no issue in transferring data between the phone and a PC using the T5. Android compatibility is nice to have, but we would definitely like Samsung to provide exFAT support through the Portable SSD app.